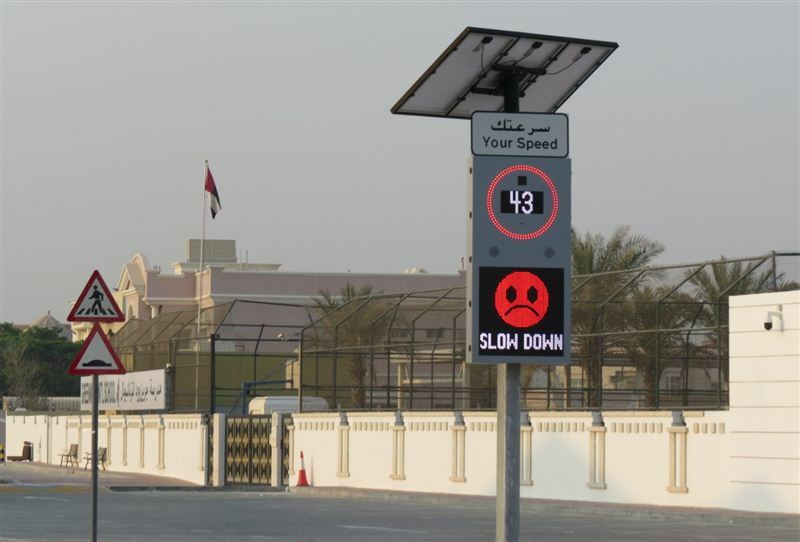 In the first week of the current school year, the Roads & Transport Authority (RTA) started sending smart messages to interact with motorists and parents when driving in school zones through smart signs capable of detecting & displaying the driving speed and sending direct friendly messages to the drivers through expressive emoticons such as WhatsApp Emojis. These facial expressions reflect drivers' psychological mindset, coupled with tips relating to the driving speed as the vehicle passes by the devices & sensors installed near school zones. Engineer Maitha Bin Adai, CEO of RTA Traffic and Roads Agency, said: "Phase I of the project was tentatively commissioned in five areas in the first week of the school year, including Muhaisnah 1, Al Mazhar, Al Wasl, Al Garhoud and Al Safa. Other areas will be covered in Phase II in other areas as per engineering standards based on the type of the road, the number of schools therein, and the number of speeding tickets issued in those areas. “The smart signs are devices equipped with digital screens capable of capturing and showing the driving speed as the vehicle passes through a school's zone, along with Emojis that intelligently depict the driver's mental state while driving. A smiling face indicates the driver is compliant with the prescribed speed limit while the frowning face means the driver has exceeded the speed limit specified by the RTA out of it keenness to ensure students’ safety and reduce traffic accidents. Then the smart signs display either tribute remarks, alerts or warnings indicating to drivers the speed limit allowed on a given street,” elaborated Bin Adai. "The underlying idea of these smart signs is based on the findings & recommendations of scientific studies that had proved the success of these signs in inducing the intended impact on drivers as they address and tell each driver individually about his/her speed and driving behaviour and they are not generic. Such a customised message gives the driver a personalised impression that he/she is personally meant by that message, thus creates a direct and intended impact on the driver,” continued Bin Adai. The smart signs project in school zones supports the RTA strategic drive regarding traffic safety and is a step forward towards utilising modern technologies to make Dubai streets smart. They can shape drivers attitudes and harness them to serve the traffic safety objectives in Dubai in line with the Dubai Government smart drive. Dubai is no longer a typical Middle Eastern city, but a global model of modern and smart cities, and the world's best city in terms of roads and bridges infrastructure. So we are well-aware of the importance of such smart and unprecedented initiatives in our current and future projects, particularly when it comes to the safety of road users and reducing traffic accidents projects in line with RTA traffic safety strategy,” noted Bin Adai. “The smart signs are part of several projects and initiatives targeting students, school zones and surrounding areas, following the Agency’s success over the past six years in eliminating fatal traffic crashes and achieving zero deaths in school zones,” concluded the CEO of the RTA Traffic and Roads Agency.